What’s the difference between a hand puppet and a glove puppet? Hand puppets are what many people think of as ‘muppet style’, with a three-dimensional foam head and moving mouth. Read more about hand puppets here. Glove puppets have a basic glove, and you move the arms and head with your fingers. The body is flat, and the head may be flat or 3D. Read more about glove puppets here. As each puppet is different, they all cost different amounts. The cost will depend on the complexity of your design and the type of puppet or toy you would like. If you send an image of your design (or a description if you don’t have a design yet) to mari@picturetopuppet.co.uk we’ll be able to give you some options. How close to my design can you get? Pretty close! Have a look at our comparisons gallery to see some examples of our puppets and toys next to the designs we were sent. Can you do the design too? Yes, we also offer a design service if required. Have a look at our design services page for more. Can I get a puppet that looks like me? Yes! 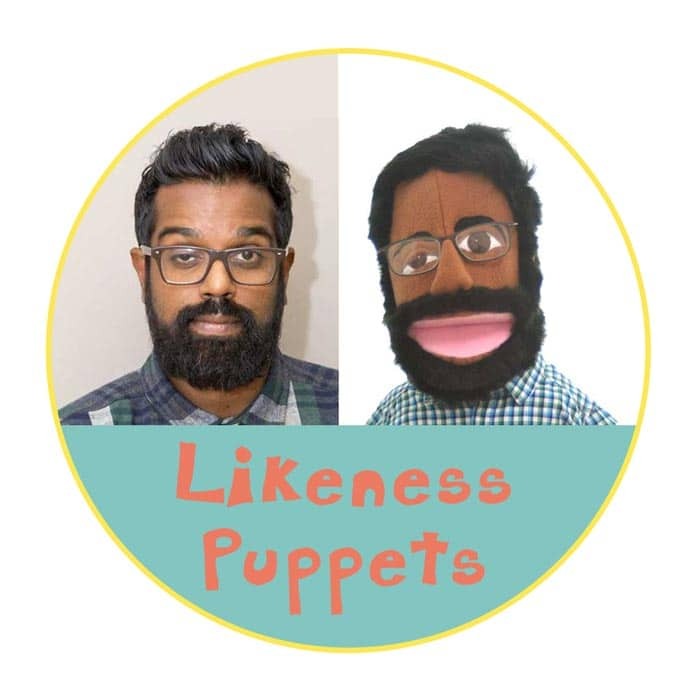 We can make a puppet that looks like you or anyone else! Just contact me with a photo. What about a puppet that looks like my pet? Or my favourite weird animal? Yes! We can do likenesses of specific pets, or generic animals. See more information here. Can I have moving features on my puppet? We can do lots of different kinds of mechanisms, including blinking eyes, moving eyebrows, arm rods, and more! How long does it take to make a puppet? Our standard lead time for custom builds is about 4 weeks. We also offer a 1-2 week speed build option at 20% of the total cost of your order. It takes a few days to make each puppet, but we normally have a backlog and often need to order in individual materials for each puppet. We take payment when you place your order. Companies or organisations may also raise a purchase order and pay on completion. We accept bank transfer, personal cheque, or we can send you an invoice through PayPal. Or you’re welcome to come by our studio in Leith and pay in cash. There is no minimum order quantity for our soft toys or puppets, we can do any number from 1-100. Yes, we ship worldwide. All of our puppets are made in Edinburgh, Scotland. How long will my puppet last? We believe in building our puppets to last. We are so confident of this that they are guaranteed for 5 years, so if they do break at all within that time we will repair them free of charge, no small print, no questions asked. What size will my puppet be? A comfortable size for a moving mouth puppet is about 50-90cm tall, but we can make other sizes workable if needed. Unless it’s really huge, the size shouldn’t affect the price of your puppet. Glove puppets are usually about 25-40cm tall. Soft toys can be any size. Can I see what my puppet will look like before it’s finished? Each puppet is custom made to order, so you won’t be able to see your individual one until it’s made. But you can take a look at the gallery for lots of other examples to get an idea of what it will look like! The more info you give us about your requirements, the closer we will be able to get to what you want. If you’re happy with your order, we’d love it if you can leave a review for us on our Google Places page! What kinds of toy repairs do you do? We repair all kinds of dolls and soft toys, including teddies and any other stuffed animals, new and antique. We also repair all types of puppets and marionettes. Unfortunately we can’t repair anything made of metal, or electronics. You can find more information about our toy hospital services here.